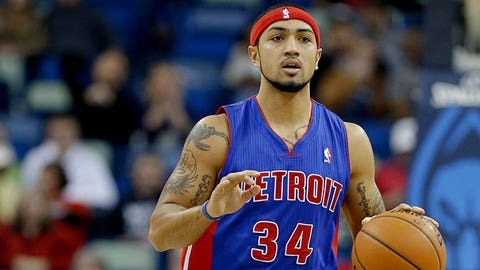 Peyton Siva has only played 76 minutes in Detroit's 30 games, scoring four points. Tony Mitchell and Peyton Siva are finally going to get some playing time. They will just be doing it in Fort Wayne. The Pistons assigned the rookies to the Fort Wayne Mad Ants of the D-League in order to get them the minutes they need for their development. Siva has only played 76 minutes in Detroit’s 30 games, scoring four points, while Mitchell has 11 points and 11 rebounds in 37 minutes. Detroit selected both players in the second round of this summer’s draft. Mitchell was a power forward at North Texas State, while Siva, of course, was the point guard for Louisville when they beat Michigan in the national-championship game in April. The pair are expected to make their Fort Wayne debuts Saturday against the Rio Grande River Vipers.